Earlier this year, President Obama’s Supreme Court nominee joined an opinion with the 2nd Circuit Court of Appeals ruling that Second Amendment rights do not apply to the states. 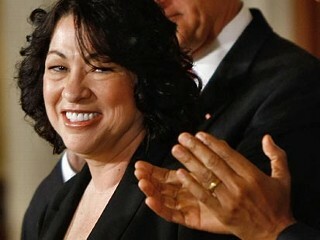 Sonia Sotomayor smiles as President Barack Obama announces her as his Supreme Court nominee at the White House. Judge Sonia Sotomayor could walk into a firestorm on Capitol Hill over her stance on gun rights, with conservatives beginning to question some controversial positions she’s taken over the past several years on the Second Amendment. Such a line of attack could prove more effective than efforts to define Sotomayor as pro-abortion, efforts that essentially grasp at straws. Sotomayor’s record on that hot-button issue reveals instances in which she has ruled against an abortion rights group and in favor of anti-abortion protesters, making her hard to pigeonhole. But Sotomayor’s position on gun control is far more crystallized. The chief concern is her position in the 2009 Maloney v. Cuomo case, in which the court examined a claim by a New York attorney that a New York law that prohibited possession of nunchucks violated his Second Amendment rights. The Appeals Court affirmed the lower court’s decision that the Second Amendment does not apply to the states. The ruling explained that it was “settled law” that the Second Amendment applies only to limitations the federal government might seek on individual gun rights. Justice David Souter, whom Sotomayor would replace, dissented from the majority decision in D.C. v. Heller, so Sotomayor wouldn’t necessarily tip the balance on such issues. But she’s joining a split body — the D.C. case was a 5-4 decision — and with the Maloney case likely to be appealed to the Supreme Court her presence could be threatening to gun rights groups. “We have concerns and we have questions,” Andrew Arulanandam, public affairs director for the National Rifle Association, told FOXNews.com. He said the NRA would work with members of Congress to have those concerns addressed in the coming months, and that the NRA has researchers looking more closely at Sotomayor’s gun rights record. Ken Klukowski, a fellow and legal analyst with the American Civil Rights Union, predicted this issue would heat up as the confirmation process moves forward. “If this nomination were not to succeed, it would likely be because of the Second Amendment issue,” he said. Klukowski questioned the brevity of the Maloney decision, which spanned only a few pages, more than the actual conclusion. He said it glossed over decades of relevant legal precedent. “The idea that you would be the first circuit court to take up this profound, constitutional question after the Supreme Court’s landmark ruling and only give it one paragraph is stunning,” he said. But Paul Helmke, president of the Brady Campaign to Prevent Gun Violence, said the issue of Sotomayor’s gun rights position is being “overblown” since the court was merely following precedent. He agreed that the Heller decision did not mean Second Amendment rights apply to states. As interest groups launch a heated campaign to define Sotomayor and draw the battle lines ahead of her confirmation process, the White House has voiced unequivocal confidence in her judgment. FOXNews.com’s Judson Berger and FOX News’ Shannon Bream contributed to this report. Only supporters of tyrants and tyrants would say that the Second Amendment rights do not apply to the states. What’s next thinking for ourselves and showing compassion for others and being a Christian being made a crime. If this happens it is the right of the people to overthrow the government and hang these tyrants for treason.